In the idyllic Swiss village of Nuglar, close to Basel, Dominique and Adrian are ploughing the Swiss 2000m² global field. The global field is part of the “Nuglar Gardens”, a non-profit association for solidary agriculture. Consumers and producers have joined forces and are collectively responsible for their food supply. 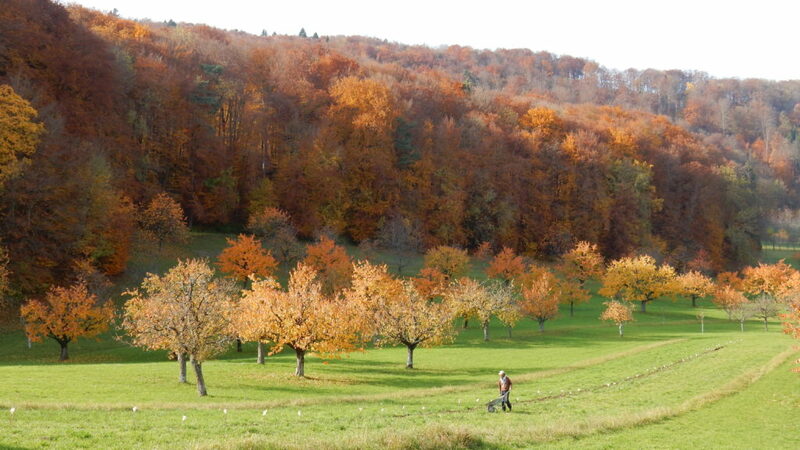 The Swiss 2000m² global field is managed bio-dynamically according to the principles of permaculture. The Nuglar Gardens cover a total of 7 hectares of land and are an initiative from the Urban Agriculture Network Basel (UANB) UANB links more than 50 self-managed projects dedicated to nutrition in the Basel region. On the Swiss 2000m²global field, world food production is presented comparatively, as is the case on Berlin global field, thus making the current global approach to our fertile soil visible locally. Everyone, regardless of age can participate in “Field Days” and physically experiencing the work on 2000 m². While cooking the “Field Lunch” on the field, the area requirement of a plate Spaghetti-Pomodoro or a sausage with fries can be realised concretely. During two different “Field Weeks”, the holistic processes and background of our food supply can be seen and experiences. During “Field -Celebrations” get together to give thanks for the harvest of our 2000m² global field. In all this, young and old can learn how simple and joyful sustainable action is in the community. Come and discover your food again! We are looking forward to seeing you! In the Nuglar Gardens a mindful relation with all creatures is very deap in our heart! First Field Saturday in Switzerland: Betty and Balduin are joining us!